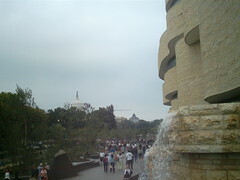 I walked down to the new National Museum of the American Indian this afternoon, hoping to catch a short line in its last open hour, but no luck: while the museum remains popular, entry requires a timed pass, and it will probably be so for a long time, as with the Holocaust Museum and the Washington Monument. I took some pictures instead, then walked around the First Americans Festival to get some native corn soup with pork (slightly gamy) and iced mint tea (minty!). 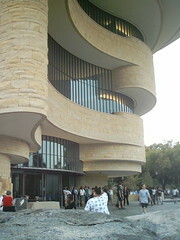 The NMAI is a lovely structure, yellow stone and sweeping curves evoking native dwellings and the natural world, while simultaneously complementing the the neighboring Capitol Dome and the gravelly paths of the Mall. 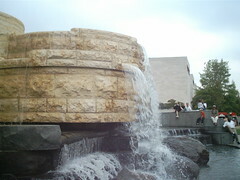 A fitting tribute to America’s native heritage, I think. my tribal leaders were there – they said it was awesome. 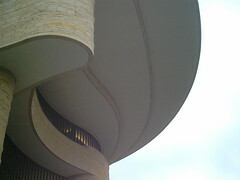 i thought the building was awesome when i was there… they let us native interns take a tour of the empty building.